MINIAK comes with its own gooseneck mic. 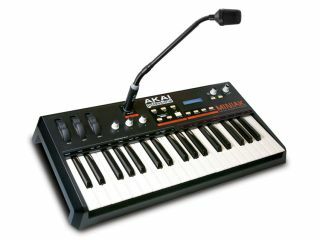 PRESS RELEASE: Akai Professional, the name synonymous with music production, announces that the MINIAK, the synthesizer specifically designed for today's music production and performance styles, is now shipping to retailers. The MINIAK is a new synthesizer from Akai Professional. It was developed in partnership with the world-renowned Alesis synthesis team. The MINIAK brings together Akai Professional's excellent control feel with powerful DSP sound-generation technology. The MINIAK is a perfect synthesizer for producers in the studio and live performers on stage because, while it is extremely compact and portable, it is also a powerful instrument for creating sounds for performance and production. The MINIAK enables users to create programs with up to eight multi-timbral voices, each with three oscillators. The user can create interesting and unique sounds and take advantage of the synthesizer's more-than-600 preset sounds. Users can create complex and refined sounds using the MINIAK's two multimode filters, three envelope generators, two LFOs, stereo effects and 40-band vocoder with gooseneck microphone. The MINIAK also has a comprehensive sequencer with step and dynamic real time phrase sequencing, a drum machine/rhythm sequencer and an arpeggiator. Users will appreciate the MINIAK's high-resolution, 24-bit balanced quarter-inch inputs and outputs for excellent sound quality. The MINIAK has a 37-key semi-weighted keyboard with velocity sensitivity for all-in-one performance. It can also be used as a sound source for MPCs, computer software and keyboards via MIDI. "We have been watching a trend in music production towards using more synth sounds alongside samples," said Adam Cohen, Director of Business Development, Akai Professional. "The MINIAK is the perfect way for anyone to get into synthesis, yet it is powerful enough for any professional to create the precise sonority they are after." The MINIAK is available from musical instrument and professional audio retailers and has a U.S. Retail Price of $699.00 with an estimated street price of $499.00.